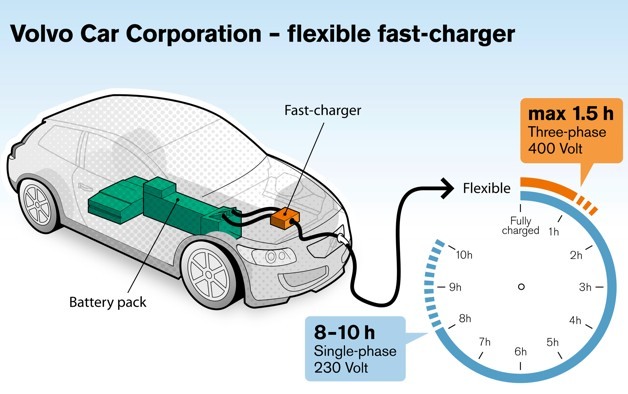 Volvo Car Corporation is testing a new fast-charger for electric cars that cuts recharging time to an outstanding 1 - 1.5 hours. The fast-charger operates six times faster than today's on-board devices. "We know that short recharging times and extensive operating range are a necessity for potential electric car consumers. The fast-charging unit helps cure what is known as 'range anxiety' since the car can be more easily recharged during the day. And even if you don't have enough time for a 1 hour charge, plugging in for just 30 minutes will give you enough power for another 80 kilometres of driving," says Lennart Stegland, Vice President Electric Propulsion Systems, Volvo Car Corporation. Using a three-phase outlet with 32A gives an 80 km range in 30 minutes. A full charge takes 1 - 1.5 hours. Plugging into an ordinary single-phase 230 V household outlet gives a charging time of 8-10 hours, depending on the available current. "The user can 'top up' the battery pack with electricity one or more times during the day. This means that the total daily range is significantly extended, yet with the same low operating cost compared to a car with a conventional power train," says Lennart Stegland. "Giving customers more usable hours each day means that electric cars become more viable as a commercial proposition, in both the private and public sectors."